Plus Size Kitten: I got my Liese Bubble Hair Dye! FINALLY! LIESE BUBBLE HAIR DYE! Yes people! the Liese Bubble Hair Dye is in the market now! after several months (and year) of waiting, now we can all relax and stop asking "when is liese bubble hair dye going to be sold in msia?" I think I already have phobia of answering the questions each time my readers asked! SO HERE in my hands I have the bubble hair dye in Mocha Orange and Chestnut Brown. My hair has already been dyed before with Marshmallow Brown (Liese) in March so what I am going to do in this weekend is to get 4 or 5 girls to come to my house and I will perform a Color Makeover for them! of coz with a few helping hands too. Who are they? well I will tell you soon! I selected them through my facebook (lol). I will show you girls why a box is enough for two short hair girls! seriously! because of the foam technology, you can easily cover your hairs faster and more efficiently so leaving a whole lot bottle left for a second person to try on. Don't believe me? I only used 1/2 a bottle for my long locks (yeah my tarzan locks remember?). dye hair just by foaming up your hair? yeah i love it too! Toni&Guy also came up with a new dye technology, seems it's as easy to use too. Just washing your hair you would be dying it! can't wait to see how this turns out, compare to liese! good idea Cindy :) bring ur friend if she's willing to let me experiment on her n put photos of her in my blog yap! hey u gona dye again? Doroshi: u gona re-dye again? wanna do all this together? Great! I went all the way to Spore to purchase the hair dye in chestnut brown for s$17.90 last weekend and now its available in Malaysia! my hair is already a dark brown with highlights done before cny this year, so i got a box from watsons in glossy brown.. my highlights are now muted and the colour is most obvious at the crown.. loving the soft colour which is not too obvious so i don't stand out too much at the office..
my hair is waist length but layered. do u think 1 bottle is enough? Hi Fei Li Xia: the dye is not as damaging as other dyes in the market. 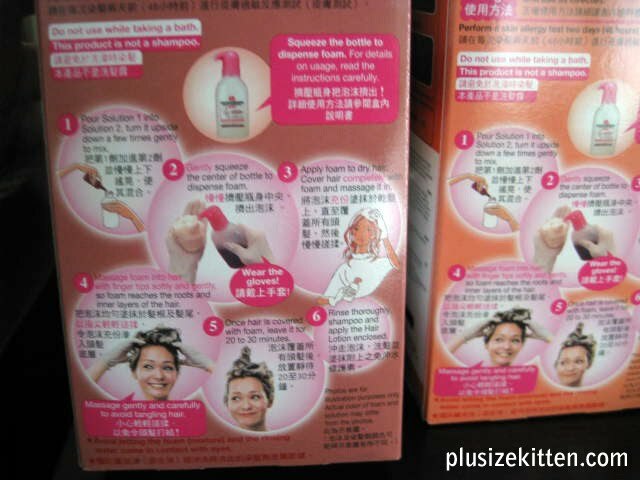 For this Liese Bubble Hair Dye, I am quite impressed with the after-effects of using it, my hair is not very dry or damaged as compared to other brands that I have used before in my life. But it still depends on your hair texture and whether your hair is damage already before use (coz damaged already n dye somore, will be more damage). Anonymous: waist length, layered hair. I think one bottle is enough, unless your hair is thick and abundance (even after layered, then u need 1 1/2 bottle). Angela: wow... good to hear this Angela!!! chestnut brown is not a very dark brown color right? i agree :D easy to use n not messy! Piper: WHOOOHOOO!!!!! tell me how ur coloring go okie? color come out or not? Hey girl, this products looks tempting to me, i have long hair over my chest, is one bottle enough for me? After my friends used the Liese hair dye, the colour on the bottom part of the hair are different from top part. And the smell is so horrible! What type of blogger are you?! You are not honest in your reviews as you only mentioned the positive side. Heidi: sorry for the late reply! one bottle should be enough for your long hair, as my hair was also up till my chest. Anonymous: Hi, it's common for the dye smell to smell strong and with dye chemicals. I did not state it smell nice or etc. The one I bought from Singapore was great for me. Also the coloring is based on how you color/coat your hair and it's not the product's fault if your have different shades on top and bottom. why u think like that, i just reply your questions only. This post din say anything about the hair dye but that i receive it and going to dye hair on several girls. For diy hair at home, the outcome/results depend on how you dye it. It will be different for each people. Mine is bought from Singapore, it was good experience for me. I use many diy hair coloring before, it is common most hair dye is strong smell due to the chemicals. Why you like that one? You are writing reviews but you only mentioned about the positive side. Then it is not blogging anymore, it is paid advertisement and misleading readers. 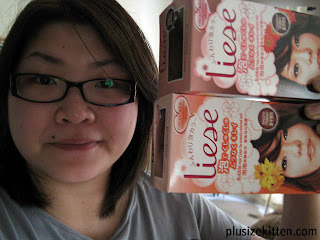 I love the Liese bubble hair dye, is easy especially if u r lookin for DIY, save u few hundres from doin in a saloon. But is not great on coverin grey hair la. Color wont be obvious on the first week, but the more u wash...now on my 2nd month, the color is very nice much nicer than before. I like it...and my hair ends not frizzy or damage or dry at all. Smell wise for me better than the saloon one. Anonymous: hmm from the way u posting questions here is like accusing Miu for being misleading and cheat people. Different people use the same product, has different outcome and feelin abt it. You don't need to be so agitated though. Hi. Interesting product. Do I have to wash my hair again with shampoo+cond after the dyeing process? I have yet to use it, but i alr bought it. Some have told me it is good, while some said it is very bad, Im curious to know if it is really horrible..
have fun with it, it's just a diy home coloring kit that uses foam instead of your conventional liquid type dye. hey, i just wanna ask that how long will the colour last and its worth to buy ? Anonymous: until hair grows out and this product is just a DIY at home hair coloring. If you're serious about getting proper n professional hair coloring, i advise to go saloon to do or someone with experience to help you dye your hair. I've used liese bubble hair color. It has pro's and con's from my experience. 1. The color turned out beautifully on my dark long hair. 2. It somehow made my hair softer and smoother. 3. Before i did the coloring, i already had a different shade on the lower part of my hair, thus after coloring, shade is also a bit different. But it still looks nice. :). 4. The chemical smell is quite overwhelming. Generally, you can save money. But if you are not confident enough to DIY and worry about having negative results, don't use it. BTW. I've read a lot of reviews from other people, obviously, results vary. So stop accusing Miu. Thanks for commenting, appreciate your understanding in using diy hair coloring kits and your feedback on it! Pls stop accusing me =_= coz I am just blogging based on my experience using it. It is easier to use than those conventional DIY hair color such as Loreal and Revlon. So far i have not come across any DIY hair color with nice smell. Hi, I bought the chestnut brown and haven't try it out. I have a middle long hair with different shades start from ear level which is lighter than top part. Do I need to dye the upper part and leave it bout 10mins before start the lower part in order to make it looks even or just straightly dye the whole hair? 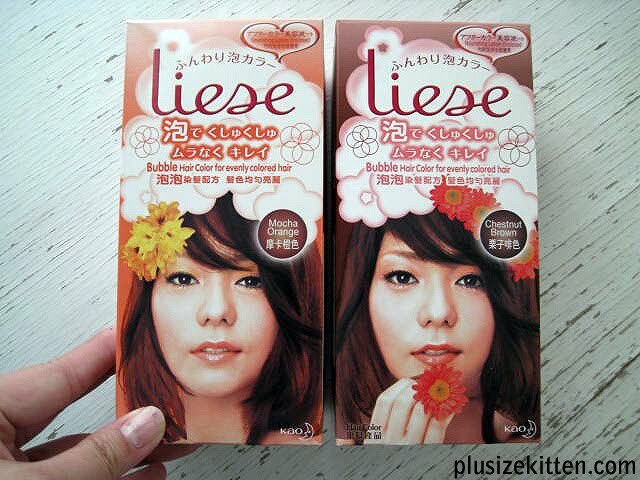 Hi, Is there a certain brand/kind of shampoo/conditioner that is best paired to use after you dye your hair with the Liese Bubble Hair Dye so that you can prolong the color. I guess I am a tad bit confused as to the taking care of the hair afterwards part. Should you wash out the foam with just water, or a certain shampoo? Do you avoid washing it for a couple days after as well? The best shampoos to use after you dye your hair (to prolong your hair color) are shampoos under the color protecting category. Most shampoos would state that on the product cover - for color hair. You can also ask the promoter/beautician at the store to verify if the shampoo is for colored hair. As for shampoo-ing right after you colored your hair (if diy at home, just use a normal shampoo to wash the dye off and then condition your hair). The only worries is don't go swimming in chlorine or salt beach water, it would affect your hair color. Also do take note that after you color your hair, make sure to dry it properly before sleeping or lying down on any white/bright colors. The hair color might stain the sheets/pillows. According to hair conditions, the effects will be different. For me, I have dry scalp and frizzy hair to begin with, when I used the Liese Bubble dye i found out that it's not as drying as other diy hair products in the market that I have used. Since you have many chemical service done to your hair :( it's best not to dye your hair on your own and go to a professional.